Too many of us have known young girls who were once fearless, inquisitive, active and loud as children, but by adolescence had grown unsure of themselves, and their bodies. I was that girl. According to research by the Harvard Graduate School of Education, girls are less likely than boys to act, and feel, like a leader. And we know first hand the damaging impact of young girls looking in the mirror and being unhappy with what they see. But rather than lose hope or resigning to the current state of women's media, Erin Bried chose to create something radically different for her daughters and girls everywhere. Bried told Refinery29 that the idea came to her in the magazine aisle with her daughter, "What a totally depressing place for girls! Every single title on the rack sends the message that there's only one right way for a girl to look, dress, and act, and it’s usually like a princess. My daughter happens to prefer pirates, so we left empty-handed." Months later Bried has partnered with an impressive roster of female influencers to create a new kind of magazine for girls, and she has launched a Kickstarter page to get the magazine printed and into the hands of the young girls who need it. 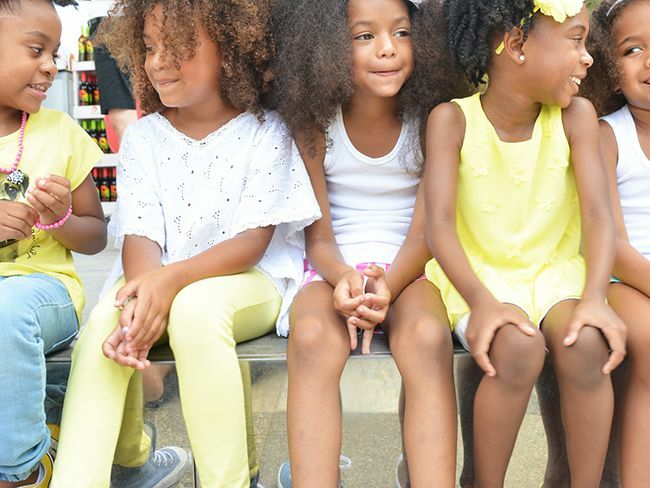 CC: Many of our readers are mothers who have gone natural to show their daughters how to love their hair. How have you found ways to lead by example for your own daughter, especially when it comes to self confidence? CC: Your Kickstarter says "six in ten girls stop doing what they love, because they feel bad about their looks. And by age 11, 30 percent of them have already put themselves on a diet." How will Kazoo tackle the difficult topic of body image for young girls aged 5-10? EB: One of the things I admire most about little girls is that most own their bodies without any measure of self-consciousness, and I want to do everything I can do to keep it that way. So, in the pages of Kazoo, I don’t plan on running very many, if any, pictures of girls at all, because I don’t want to ever put the reader in a position, where she compares herself to another girl. Instead, when a girl reads Kazoo, her gaze will be directed toward the activity at hand. A story on making Mexican ice pops, for instance, won’t feature a photo of a girl making popsicles. It’ll show the popsicles, because it’s the pops that matter, not how she looks making them. In addition, every issue will include a section on sports—and not watching them, but playing them. I want girls to know they can be strong, fast and fierce, and there’s a tremendous amount of freedom, joy and power to be found when you feel at ease in your skin. I don’t plan on running very many, if any, pictures of girls at all, because I don’t want to ever put the reader in a position, where she compares herself to another girl. CC: Judging by the content in ad campaigns and our social media feeds it's easy to feel like feminism is "trending," and yet you point out that "girls and women are completely underrepresented in our culture. Look at Congress (80% men); the modern art section of the MET (95% men); the engineering profession (89% men); Oscar-nominated cinematographers (100% men); even children’s books, where boy characters are 3 times more likely than girl characters to appear." What do you feel it will take to move the dial on some of these stats? EB: Someone else just told me that feminism was “so hot right now with Beyonce and all.” Believing that girls and boys, and women and men, should have equal rights and opportunities is certainly not a new concept, but I’m thrilled that it’s one that we’re at least talking about in a positive way. But it’s not enough to be “trending” especially if that replaces real change. I want Kazoo to inspire the next generation of leaders so that this lack of representation become less of an issue for them— and their daughters. CC: You have some amazing contributors lined up for the first issue. How did you convince them to sign on, and what advice do you have for other women who may be looking to collaborate and connect with like-minded women on a project? EB: I emailed artist Mickalene Thomas, chef Fany Gerson, Fulbright Scholar Meenakshi Wadwha and Caldecott Honor winner Doreen Cronin out of the blue, and to my great delight, they all liked the idea of the magazine so much that they answered with a resounding yes. I know MacArthur Genius Alison Bechdel, National Book Award Winner Jacqueline Woodson and New York Times Bestseller Lucy Knisley from working in publishing for so long, and I now consider them all personal friends. But knowing them didn’t make it any easier for me to reach out to them. In fact, it made it even scarier, because I didn’t want them to feel pressured into saying yes, or worse, to say no. But you know what? ’s first issue, and it’s amazing. My advice on connecting with other women: Don’t let fear hold you back from asking for help. CC: What is your goal for Kazoo? What would constitute success for you? EB: In the short run, my goal is to raise $150,000 by April 25th. That’ll cover the cost of creating, printing and shipping 5000 issues four times in the first year. During the first year, I want to build the audience. I want to be sure I have a large enough subscriber base to really make this work. In the broader sense, my dream is to get KAZOO into every little girl's hands, so she can not only read, laugh and learn, but also see the world from a new perspective, one where she is celebrated for being smart, strong, fierce, and, above all, true to herself. CC: You have over 16 years of experience creating content for women through your work at SELF magazine, GLAMOUR and WOMEN'S SPORTS & FITNESS. How has your time spent catering messages to adult women influenced your vision for Kazoo? EB: The biggest lesson I learned from working in magazines for as long as I have is to know, and respect, your reader. If you do that, you’ll be able to connect in profound ways. CC: What advice do you have for women with a great idea who want to start their own business venture? EB: Do your research, first. Learn as much as you can. And then just go for it. It’s never going to be not scary, so you might as well just get on with it before someone else does. 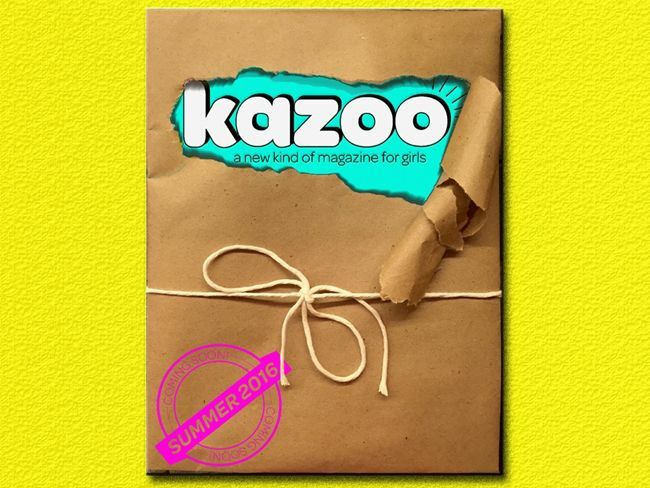 If you'd like to be a part of bringing this magazine to life, head to the Kazoo Kickstarter.